VigilantCS is a RegTech solution focused on compliance automation for the financial services industry. Our platform serves as a knowledge-base and centralized hub for dealers, advisors and investment fund managers that enables cost-effective compliance, improved controls and analytics to reduce conduct risk. VigilantCS enables you to enhance the value of your firm as a trusted brand by supporting your staff in serving the financial needs of clients. Rob has held executive and senior-level roles in legal and compliance capacities in securities commissions and investment companies in Ontario and British Columbia. He is a member of the OSC Fintech Advisory Committee (FAC) and the IIAC FinTech Working Group. Geoff is a versatile and innovative technology-oriented senior executive with experience in IT, information security, privacy and risk management in several sectors, including financial services. His expertise includes FinTech/RegTech, Information Security/Privacy & IT Risk Management. Jade is a PhD candidate in management-organizational behaviour at Carleton University, Ottawa. A former associate senior section member for the China Banking Regulatory Commission, Jade developed the initial base to collect information for the VigilantCS behavioural and machine learning algorithm. The RegTech 100 was chosen by leading industry experts following an analysis of 416 RegTech companies undertaken by FinTech Global. 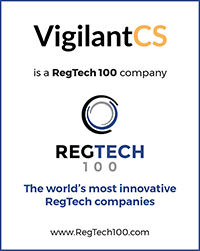 VigilantCS is one of only three Canadian and one of only 100 global regtech firms to make the list in 2017.